Welcome to a new baby!!! Micah James Sewell, son to Justin and Kristen Sewell and younger brother to Noah and Caleb Sewell, was born this morning at 7:40am. He was 7 lbs 9 ozs, 21 inches long, with a little bit of some sandy blondish hair. He swallowed some amniotic fluid which caused some initial difficulty breathing, but he is doing quite well now. Justin says Micah is very pink and definitely does not have any jaundice (which Noah and Aidan both did). Anyways, I just wanted to celebrate and share with you all the arrival of my new nephew. Woo-hoo!!! (for anyone who is wondering who Justin and Kristen are--Justin is one of my older brothers). 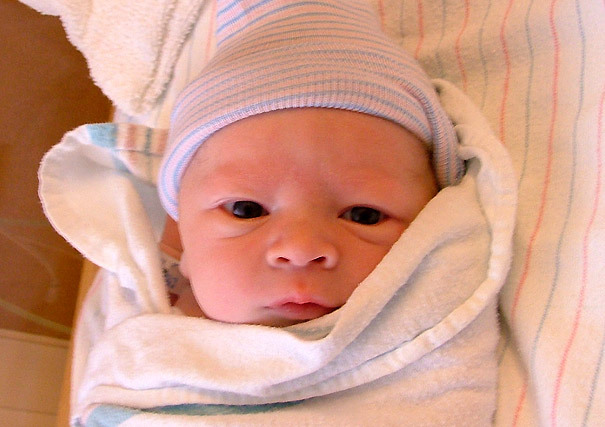 *just to be absolutely correct, it turns out that Micah was born at 7:41, not 7:40...oops!